Even though I'm not seriously starting my action RPG until about a year from now, I keep updating my notes for the idea and occasionally making mock-ups. It helps me with the waiting period where I sit on idea until I know it works. So far I've done character bios, snippets of the script, some character dialogue, arranged almost all the game mechanics, listed game elements, and drafted some GUI styles. Today I feel like peeking into the future and sharing what I have in mind for making a character walk around in an RPG. Obviously the messy picture above was scribbled out in mere seconds but it gets my idea across. I needed a visual representation of what the primary game screen would be like. A tiny but visible character, lots of room to see, transparent buttons, a pause button, and other GUI elements. I didn't even use one of the numerous drafts I have for what the health/magic/experience/stamina piece would look like. My goals with the interface are to have enough room for detailed hand drawn sprites, visual space to work out puzzles and see oncoming danger, semi-transparent buttons, a very transparent virtual stick/D-Pad, and the necessary GUI components along the screen edges. I know I need to align 3 main buttons: Sword/Interact, Magic, and Item. I also need a menu button and a D-Pad that isn't annoying. I may be able to manage it by putting them close to the corners and making them less opaque. when I get to prototyping I'll see how it feels. Testing out ideas like this helps me keep a clear picture of the game in my head. If I don't do it I'm bugged by thoughts of "Will that even work?" so it's best to test the small things that I can. I end up thinking about the game all the time anyway so having some "proven" features clear in my head and visible before my eyes gives me something to build on. 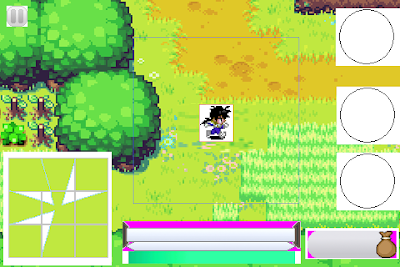 Back in 11th grade when I first tried to make my RPG, the first thing I started coding was the avatar walking and the background scrolling. I wanted to mimic the movement from games like The Legend of Zelda: The Minish Cap where the camera centered on the player and only stopped in corners of the world where the player roams without being in the center. I have evolved the idea since then and am now considering a new way to move. I was inspired by the movements of Link in A Link Between Worlds and want to have the avatar free to move about in a set square. 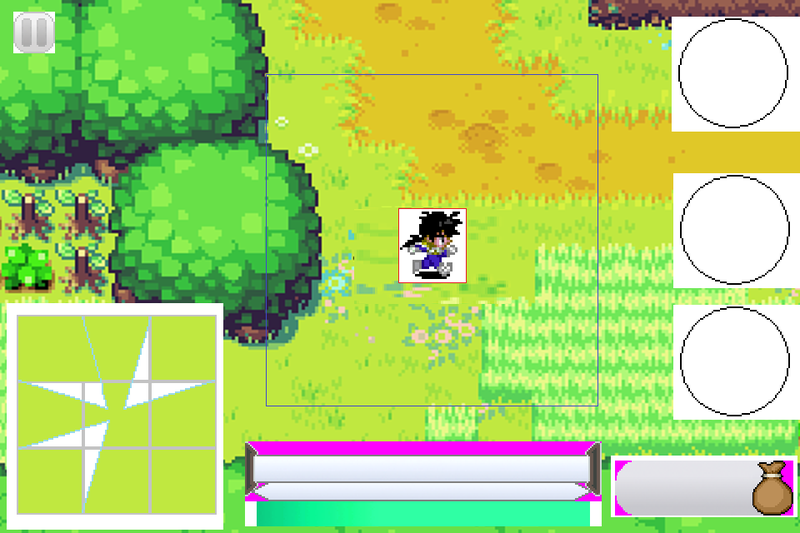 When the avatar is touching the edge of the square, the screen will move appropriately and stop reorienting when the player is centered again. This is one of those things that needs actual testing since I'm sure this method will spawn tons of bugs. Despite that, it's still a better way of thinking than my previous idea. Thinking about this stuff now saves me development time later as I'm stirring up my ideas and evolving the prototype before it even exists. When the time comes I'll adjust the idea and do some research on how other people handled movement in their games. I'm already considering making a fourth right-hand side button for actions instead of replacing the sword button in certain contexts. These are all things I'll dedicate weeks to figuring out later. Until then, I hope you enjoyed peeking into my head. If you're curious about my RPG (the one I can't shut up about) and want to see more posts about it, let me know in the comments.